SPECTREOUTREACH.com: I going to pay whatever I want! I going to pay whatever I want! Yes! I going to pay whatever I want and nobody will stop or dare lift a finger about coz "The new Ibis Singapore on Bencoolen hotel just last week launched a promotion that lets guests choose the rate they want to pay for a night's stay". Cool or what? 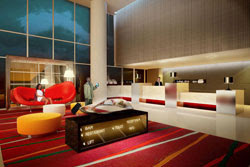 The lobby where u check in or check out! "Situated in the heart of Singapore, close to transport, major shopping and tourist attractions, this brand new international economy hotel offers trendy contemporary rooms ideal for business and leisure guests who want to save on price, not on service. Enjoy the flavours of Singapore at the TASTE restaurant offering Singapore’s 20 favourite food items in a unique Asian Tapas style.Stay connected with your work, friends and family with complimentary WiFi access available in all guest rooms. 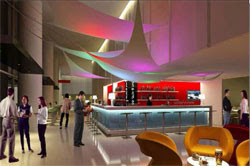 Discover the ibis today and enjoy great-value accommodation in the centre of vibrant Singapore." Comfy bed ! Me feel zzzzzzzzzz! 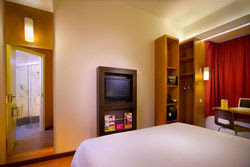 "Be one of the first to book a room during sale time, and you'll enjoy a night at the ibis Singapore for the price of your bid. Bid $30 and if you're one of the first, you'll stay for $30 – it's that easy! Stay tuned for the next sale period by checking the clock on the homepage, which counts down to the next sale time, and make a bid!" hmmmmm. Temptings offer even for me . Be the way if u are not very familiar with area. Press here for the map. Heck it even make to the Sydney Morning Herald with bidding as high as $ 100 and "the first days' rooms were sold out in minutes with bookings coming from all over the world" . PS: There is a virtual game inside the websites you can win game prizes by becoming best virtual Hotel Manager at ibis Singapore on Bencoolen to win the game prizes.